Your agent knows your situation and is best placed to give you a faster response. If you need to contact us with a question about how our loans work. How do our loans work? Find out how the Morses Club loans work from how to apply to more about our agents. I have reviewed the terms & conditions and privacy notice . We take complaints very seriously – if you need to make a complaint, find out how here. This website is operated and provided by Morses Club PLC(“we”, “us”, “our”). Our company registration number is 06793980. The website content is intended to be advisory only. In the terms and conditions of your loan agreement (including if you apply to enter into one with us) you will see separate terms and conditions. These do not govern your use of our website. 1.1 We are the owner or the licensee of all copyright, design rights, database rights, trademarks and other intellectual property rights in the website, and in the material published on it. Your use of the website grants no rights to you in relation to our intellectual property rights or the intellectual property rights of third parties. All such rights not expressly granted are reserved. 1.2 If you are using the website and have access to a printer then permission is hereby granted to electronically copy and to print in hard copy portions of the content of the website for the sole purpose of your own personal use of this as an information resource for our Products, provided any copy which you make retains all copyright and other proprietary notices. Any other use of materials on the website, including reproduction for purposes other than the above, modification, distribution or republication without our prior written consent is prohibited. 1.4 Any infringement of our rights or those of our service and technology providers or group companies may result in appropriate legal action being taken against you. 1.5 Brand names and trademarks included in the content of the news sections or blogs may be protected by third parties and rights are subject to the ownership rights of the owner. 3.1 We do not guarantee that our website, or any content on it, will always be available or uninterrupted. Access to our site is permitted on a temporary basis. We may suspend, withdraw, discontinue or change all or any part of our site without notice. We will not be liable to you if for any reason our site is unavailable at any time or for any period. 4.1 The use of third party websites is entirely at your own risk. Links contained in the website are provided for information only and will lead to other websites which may not be under our control, and we do not make any representation as to the accuracy, completeness, timeliness or suitability of information on those other websites and we accept no liability for the content of any linked site or any link contained in a linked site. Links provided on the website are provided to you only for convenience and the inclusion of any link does not imply reliability and endorsement by us of the content of any third party’s website. Morses Club expressly dissociates itself from all contents of linked pages. Morses Club can take no responsibility for quality, completeness, timeliness or accuracy of all automatically included news and presents the content without guarantee. Morses Club reserves the right to suspend, or remove any part of the news section or the whole news section in its entirety without justification at any time. 4.3 You are not entitled (nor will you assist others) to set up links from any other websites to the website (whether by hypertext linking, deep-linking, framing, toggling or otherwise) without our prior written consent, which we may grant or withhold at our absolute discretion. 4.4 You agree that when accessing the website you shall not price scrape or harvest pricing or any other content from the website, either manually or by use of a web spider, web robot or any other web crawling technology. 5.1 This website and its content are for information purposes only. While we have taken reasonable steps to ensure the accuracy and completeness of the information on the website, all such information is provided on an “as is” basis and, except where prohibited by law, we give no warranty and make no representation regarding the accuracy or completeness of its content. Morses Club has tried to ensure the usefulness and accuracy of the information provided, but does not make any representation, or accept any responsibility or liability for the accuracy or completeness of this information, nor it's suitability to be used for a particular purpose. 5.2 Some of the information contained on the website may have been prepared or provided by third parties. Except where prohibited by law, no warranty is given that the website will be available on an uninterrupted basis and, save as required by law, no liability can be accepted in respect of losses or damages arising out of such unavailability. 6.1 Please remember that the Internet is not a secure medium. Communications over the Internet such as e-mails are not secure, even if they have been encrypted. We seek to keep secure all confidential information and personal information submitted to us through the website, in accordance with our obligations under applicable laws and regulations. However, in common with all website operators, we cannot guarantee the security of any data transmitted through the website (except where the same is encrypted using methods we have approved or prescribed). Please do not communicate with us through the website, or otherwise use the website, unless you accept the security implications of dealing online. Information you send through the website is sent at your own risk. 7.1 We reserve the right to prevent your usage of the website if you misuse the contents contained within the website in any manner. We are the final arbiter as to what shall constitute misuse and our decision will be final. Why do we have a Privacy Notice? We have developed this notice because we want you to feel confident about the privacy and security of your personal information and because we would like to explain how we will use and process it. Morses Club PLC (“we”, “us”, “our”) is your controller and abides by applicable data protection laws. When we refer to "personal information" in this Privacy Notice, we mean information which identifies you as an individual (whether on its own or in connection with other information that we hold about you). For example, your name, address, email address, phone numbers, and perhaps some less obvious details like a list of payments you already make. We hold, use and share data about you in your capacity as a consumer for the purposes mentioned in this Privacy Notice. Please read this Privacy Notice carefully. It explains clearly how we will use your personal information collected when you use our website and/or apply for, and are accepted for, a loan and as part of the other services that might be included as part of this process. 1. What does this Privacy Notice cover? This Privacy Notice applies to how Morses Club deals with your personal information which is collected through our www.morsesclub.com website (our “website”), when you apply for a loan product or when we are otherwise in contact with you (for instance when you call us or email us). It does not apply to any other company or to any other company's websites even if you access them through Morses Club. If you disclose your personal information to other companies your information will be dealt with according to their own privacy policies and practices. In the terms and conditions of your loan agreement you will see additional information about data protection, credit checks and how we use and share your personal information. For the avoidance of doubt, this Privacy Notice is our primary Privacy Notice and any additional items covered in your loan agreement should be considered as supplemental. You may also be required to enter into terms and conditions associated with each of our services you use (for instance, we will ask you to sign terms and conditions which are in a loan agreement if your application for a loan is successful). 2. What personal information do we collect about you, and when do we collect it? Details of whether you have any special needs or are otherwise vulnerable* You - Completing the loan application form, contacting us or during home visits. Your comments or other information entered via our “Contact Us” page, any customer satisfaction surveys and/or in any communications between you and us including home visits. You - Completing the loan application form or contacting us, or during home visits. * The processing of these categories of personal data is mandatory in order for us to assess your eligibility for a loan and to enable us administer the loan during its term. A failure to provide this information may result in us being unable to offer you our products and services. To verify your identity and credit standing and to enable us to consider and process your application for a loan or other products or services. All categories of personal data set out in Section 2 above except your marketing preferences. This processing is necessary for the performance of our contract with you. This processing is necessary for compliance with legal obligations to which we are subject. To assess your credit history and confirm your employment details (as explained further in Section 4.) All categories of personal data set out in Section 2 above and Section 4 below except your marketing preferences. This processing is necessary for the performance of our contract with you. This processing is necessary for compliance with legal obligations to which we are subject. To perform actions in line with the contract we have with you (in particular, the loan agreement) including administering and servicing your account with us. All categories of personal data set out in Section 2 above. This processing is necessary for the performance of our contract with you. To collect unpaid loans and debt that may be owed by you to us. All categories of personal data set out in Section 2 above except your marketing preferences. This processing is necessary for the performance of our contract with you. To develop, manage and market products and services to meet your needs, to determine your eligibility for different products and services that you may be interested in and notify you about changes to our website, our services or our products. All categories of personal data set out in Section 2 above. This processing is necessary for our legitimate interests of creating new or updated products and services to improve our service offering to existing and potential new customers. To communicate with you to provide you with information about the products and services that you request from us (including for direct marketing purposes if you have opted in). All categories of personal data set out in Section 2 above. This processing is necessary for our legitimate interests of marketing new products and services to existing and new customers. Where necessary for direct marketing purposes, we will process your personal data with your consent. Customer satisfaction surveys to monitor and improve the quality of our product and service offerings (which may involve using your data in quality and performance training). Your full name and initials; postal and correspondence address(es); contact telephone numbers; e-mail address; comments or other information entered into via our “Contact Us” page, any customer satisfaction surveys and/or in any correspondence between us. This processing is necessary for our legitimate interests of assessing our performance levels and evaluating new ways to improve our products and services. To undertake market analysis, forecasting, business planning and auditing exercises in connection with our business. All categories of personal data set out in Section 2 above. This processing is necessary for our legitimate interests of management planning and forecasting in relation to our business. To communicate with you in connection with any enquiries or complaints that you raise. All categories of personal data set out in Section 2 above. This processing is necessary for our legitimate interests of responding to questions and comments raised by individuals that contact us. To detect, prevent and investigate actual and potential fraud and related activities. All categories of personal data set out in Section 2 above. This processing is necessary for compliance with legal obligations to which we are subject. To comply with laws and our regulatory requirements. All categories of personal data set out in Section 2 above. This processing is necessary for our legitimate interests of complying with laws and regulatory requirements. To, establish, defend, exercise, enforce or to protect our rights, property or safety, or that of our customers, employees or other persons with whom we have a business relationship. All categories of personal data set out in Section 2 above. This processing is necessary for our legitimate interests of establishing, defending, exercising, enforcing or protecting our rights and others with whom we have a business relationship. For monitoring and recording of telephone calls and email communications where necessary for compliance with regulatory rules or self-regulatory practices or procedures relevant to our business, to prevent or detect crime, for quality, training and security purposes. All categories of personal data set out in Section 2 above. This processing is necessary for our legitimate interests of complying with regulatory rules and ensuring we are implementing quality checking and compliance processes. To anonymise your personal data for market research, statistical and analytical purposes, including producing statistical research and reports All categories of personal data set out in Section 2 above. This processing is necessary for our legitimate interests of creating anonymous data sets that we can use for research, statistical and analysis purposes. where the processing is necessary for reasons of substantial public interest. If you apply for a loan we will use credit scoring and other automated systems to assess your application and verify your identity. Our automated systems are used to make a recommendation to our loan application about whether you should be accepted for a loan. These systems compare the information in your application form and gathered from credit reference agencies to assess the risk of non-payment if we were to grant you a loan. They do this by processing your name, addresses, date of birth, employment status, salary, details of your non-salary income, details of your regular or one-off expenses, requested loan amount, reason for your loan, previous payment history, and credit status and history and comparing it against our customer database to evaluate whether you are likely to be able to repay your requested loan amount. Step 1: Previous customers and applicants: If you are an existing customer, were a customer within the period of 12 months prior to the date of your application or have previously applied for a loan within a period of 45 days prior to your application, our systems will decline your application. If you are a previous customer of Morses Club (who has not been a customer of Morses Club within the period 12 of months prior to the date of your application), we will check our database to see whether you made your repayments. If you did not make your repayments on a previous loan, your application will be declined. If you did make your repayments, your application will pass to Step 2. Step 2: Credit Reference Agencies: Our automated systems gather information from Credit Reference Agencies (see below for more information) about your credit score and credit history. The systems check this information against our bespoke scorecards to generate a suitability score for your application. If you do not meet the minimum suitability score then your application will be declined. If you exceed the minimum suitability score, the systems will use the credit score and credit history information to determine the maximum loan value that Morses Club will be able to offer you. If your application satisfies Step 1 and Step 2, a final decision as to whether to accept your loan application and the value that Morses Club may loan to you is made by a member of our team. You have a right to request that your application is reviewed by a member of our team, to express your point of view on the decisions that we make about you and to contest our decisions. We will check your records through one or more credit reference agencies (“CRAs”) when considering your application. CRAs supply us with details of your credit history and associated information as well as information from the electoral register which is used to verify your identify and your residence. When CRAs receive a credit check search request from us, they will always record details of this search and this means they will place a search ‘footprint’ on your credit file. That footprint will be seen by other lenders and persons unrelated to us (i.e. the other customers of the CRAs) if they undertake credit checks on you in the future in connection with their own financial products and services; we will carry out “soft” searches at the CRAs after the full credit check searches if we need additional verification of your identity after receiving the result of the full credit search and if we do this no-one else except you would see that we have made this additional enquiry. We will provide information about this agreement and your repayment performance to all of the CRAs. We report to these third parties at least once a month, including details of the payments you make, payments that you do not make on time and details on any default against this agreement. Our records will remain on your credit file for 6 years after they are closed, whether settled by you or defaulted by us. Details of your payment history for loans taken with us. The CRAs can also share your information with other organisations. Your phone number data and politically exposed persons (PEPs) and sanctions data. We and those other companies will use these records and other information to make credit decisions about you. The CRA records will also be used to make credit decisions about your current spouse, partner or other individual that has been financially linked or associated with you (for example if you have a joint account with them). We will: search, link and/or record information at CRAs about you both; link any individual identified as your financial associate, in our own records; take both your and their information into account in future applications by either or both of you (as relevant), and continue this linking until one of you notifies us that you are no longer linked; links between all such persons will remain on your and their files at the CRAs until such time as you or the other relevant person successfully files for a disassociation with the CRAs. If your circumstances change such that you are no longer a financial unit with another person, you should contact the CRAs directly using the contact details in the “How to find out more about Credit Reference Agencies” section below. You can contact the CRAs currently operating in the UK; the information they hold will not be the same so it is worth contacting them all. 6. Do we share your personal information with anyone else? debt collection agencies, if your loan account with us falls into arrears, to enable them to make contact with you (whether in person, by post, email or telephone) and recover the sums owed. we use live chat software on our website, this is provided by a 3rd party UK based software company. 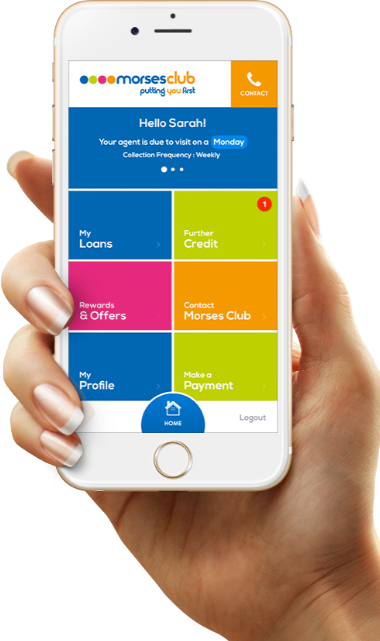 Where we have received your personal details from a broker or another provider of loan products, we will notify such broker or loan provider whether you are eligible for a loan application with us and whether you have obtained a loan from us. We will disclose your personal data to third parties if we are under a duty to disclose or share your personal data in order to comply with any laws, regulations or good governance obligations, or in order to enforce or to protect its rights, property or safety, or that of our customers or other persons with whom we have a business relationship. These third parties will include (without limitation) the police, Action Fraud, the National Crime Agency, HMRC, HM Treasury and the Department of Work & Pensions. the use of such personal data by a purchaser for the operation of its business. supplier of Prepaid Debit Cards (where you have requested that your loan is provided on a Prepaid Debit Card) who provides support services for the cards from the United States of America and uses a third party payment processor based in the United States of America to process transactions made via the Prepaid Debit Card. The United States of America is not designated by the European Commission as providing an adequate level of protection for personal data. In order to safeguard your personal data in respect of these transfers, we have implemented a data transfer agreement with our supplier which incorporates the European Commission standard contractual clauses for the transfer of personal data to processors established in third countries, under Article 46(2) of the General Data Protection Regulation. You can obtain a copy of this data transfer agreement by contacting us (as set out in the “Our Contact Details” section below). Customer communication platform. Data is stored within the EU, but our vendor uses a ‘follow the sun’ support model. Transfer may take place if a representative located in an international location accesses data for support purposes. The international location could be Australia, USA, Belarus or South Africa. The named countries are not designated by the European Commission as providing an adequate level of protection for personal data. In order to safeguard your personal data in respect of these transfers, we have checked that the supplier of the service has data transfer agreement in place which incorporates the European Commission standard contractual clauses for the transfer of personal data to processors established in third countries, under Article 46(2) of the General Data Protection Regulation. 8. For how long does Morses Club keep personal information? If you take out a loan with us, we will retain your personal data for the period during which your loan remains outstanding and thereafter until the expiry of a period of seven years. If you submit an application for a loan and your application was unsuccessful, your personal data will be held by us for up to 50 days. If you complete a customer satisfaction survey, your personal data in relation to that survey will be held by us for a period of up to 6 months from the date that you submitted the survey response. If you raise a complaint or there is a dispute between us, your personal data will be held by us for a period of up to seven years following the resolution of the complaint or dispute. If you raise a general enquiry with us (which does not involve a complaint or dispute), your personal data in relation to that enquiry will be held by us for a period of up to one month. We will retain your personal data for longer than the periods specified above if required by law, to defend or exercise legal rights (such as defending legal claims) or to comply with regulatory obligations. 9. What rights do I have to my personal data? The Right Of Access. You may request access to or copies of the personal information that we hold about (known as a “Data Subject Access Request”) you as set out in the “How can I find out what personal information Morses Club holds about me?” section below. If you would like to exercise this right, please contact us (as set out in the “Our Contact Details” section below). The Right To Rectification. You have the right to have inaccurate information about you corrected. For more information, see the “How can I change the personal information Morses Club holds about me?” section below. The Right To Erasure. You may request that your personal information be deleted where it is no longer necessary for the purposes for which it is being processed and provided there is no other lawful basis for which we may continue to process such personal information. If you would like to exercise this right, please contact us (as set out in the “Our Contact Details” section below). The Right To Data Portability. Where you have provided us with your personal information that we process using automated means, you may be entitled to a copy of that personal information in a structured, commonly-used and machine readable format. If you would like to exercise this right, please contact us (as set out in the “Our Contact Details” section below). The Right To Object. In some circumstances, you may, on grounds relating to your particular situation, have grounds to object to our processing of your personal information. We will consider any objections to its processing on the particular circumstances relating to each case. If you would like to exercise this right, please contact us (as set out in the “Our Contact Details” section below). if the processing is unlawful or no longer necessary but you wish for us to retain your personal information for the purposes of establishing, exercising or defending legal claims. If you would like to exercise this right, please contact us (as set out in the “Our Contact Details” section below). 10. How can I find out what personal information Morses Club holds about me? Your right to access, as detailed above, or to obtain copies of your personal information may extend to (but is not limited to) some or all of the following items below. We will endeavor to return your details from 1 month of receiving the request. A Data Subject Access Request is free. However, where a request is manifestly unfounded or excessive, we may require a reasonable administrative fee or refuse to act on the request. This will be based on the true administrative cost and will be discussed with the requester on application. You can make a Data Subject Access Request or exercise your other rights by contacting us (as set out in the “Our Contact Details” section below). 11. How can I change the personal information Morses Club holds about me? Please tell us if your personal information, including contact details or address, change at any time so that we can update our records. If some of the information we hold about you is inaccurate (for instance because you have changed your marital status or name, or moved house, or changed your telephone number or email address) or incomplete, please contact us (as set out in the “Our Contact Details” section below). We will take steps to seek to correct or update any information if we are satisfied that the information we hold is inaccurate or incomplete. In certain circumstances, you may also request that we restrict our processing. 12. How can I manage Morses Club’s contact with me for marketing purposes? If you are opted-in to receive direct marketing communications, for instance when you submit your name and contact details through our website, or when you apply for a loan, we will use your contact information to communicate with you in relation to products and services which you have confirmed you would like to hear about from us. Depending on the specific permissions you gave, we may contact you by post, SMS, telephone or email. To change your marketing preferences, you can contact us using our contact details set out in our Contact Us page. We will process your request within a reasonable period of time. Any marketing communication by email or SMS which are from us will also include details of how you may unsubscribe. 13. How do we protect the security of your personal information? We are serious about guarding the security of your personal information and the details of any transactions or applications made. We use the triage of Confidentiality, Integrity and Availability (CIA) as the keystones to our technical and organisational controls. This helps us protect against unauthorised or unlawful processing, accidental loss or destruction of, or damage to, your personal information. 14. How do you obtain copies of our Privacy Notice? If you require a printed copy of this Privacy Notice or a copy in another format such as audio or Braille, then please contact us using the contact page. You can contact us by post at Morses Club, Kingston House, Centre 27 Business Park, Woodhead Road, Birstall, Batley, WF17 9TD, by e-mail at DPO@Morsesclub.com by telephone on 0330 045 0719 or using our contact form on our Contact Us page.